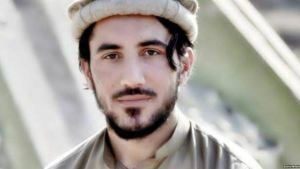 LAHORE: Pashtun Tahafuz Movement (PSM) Leader Manzoor Pashteen on Tuesday lamented the continued extrajudicial killings, enforced disappearances and racial profiling of the Pashtuns by state authorities, saying that the community was caught in the crosshairs of a war that they never asked for. The PSM leader addressed two different gatherings in Lahore, one of which was organised by the Pashtun students of Lahore at a location in Garden Town, while the other was held at the Lahore University of Management Sciences (LUMS). At the first event of the day, Pashteen was received by passionate students who showered him with rose petals amid slogans seeking autonomy for the Pashtuns and an end to the state brutality. “The demand of the Pashtun is peace. I have no political agenda, the Pashtun nation has no political agenda. We simply want an end to the nightmare we have been living ever since we can remember,” he said addressing the crowd. “There are at least 32,000 extra-judicially missing persons in the Khyber Pakhtunkhwa (KP), particularly FATA,” Pashteen said. “Missing persons—these are only a couple of words, but this term encompasses thousands of lives and countless tears of waiting mothers,” he added. Pashteen, who recently emerged as a rising champion of the Pashtun cause during the Pashtun long march in Islamabad after the murder of Naqeebullah Mehsud, went on to relate a number of harrowing stories, and describe the draconian techniques with which tribal areas and their residents were suppressed. “They have dehumanised us,” Pashteen told the packed crowd at LUMS. “Pasthuns first have to prove that they are human and then they are able to get some sympathy. The Burmese have been lucky in that Pakistanis see them as human unlike Pashtuns,” he said to a thundering applause. Criticising the military’s role in the so-called war on terror, Pashteen said they don’t really care about the people of FATA. “It is an absurd fight between the Taliban and the Pakistan Army, which only targets civilians,” Pashteen stated. “If the army claims they are suffering losses, then they should join us because we are simply peace advocates,” he said when questions from the crowd arose regarding the sacrifices the army has given in the region. “For us, there is no good or bad Taliban, there are only people that have wreaked havoc in our lives,” he ended. Pashteen went on to add that the lands of FATA had been made uninhabitable and that landmines have killed hundreds since the military operations in FATA. FATA is in ruins, people can’t return to the area because of landmines and check-posts that plague the region, as one brings death while the other humiliation, he said. The only people who now live in FATA are very poor who cannot afford to rent a house outside FATA. And these are the people, who often get killed in these blasts. And to rub salt into their wounds, the government hasn’t even established a single hospital in the area. Pashteen said if the state keeps on acting with impunity, another vacuum might be created which might blow things out of proportion. “If a pressure is implied to silence us, it can beget the same,” he said. “I am afraid that if we are pushed to a certain extent, the pushback will be stronger than these authorities will be able to handle,” he warned. He, however, ended his speech with a lesson to the youth, saying peace and justice could only be sustained through love, harmony, non-violence and eradication of differences through dialogue and understanding.